Families throughout Las Vegas can treat mom to a special meal this Mother’s Day with delicious menus available at the various restaurants throughout JW Marriott Las Vegas Resort & Spa and Rampart Casino on Sunday, May 13. Mom can feel the love with a variety of menu options at Ceres, Carmel Room, The Rampart Buffet and Promenade Café. Breakfast pastries and fresh fruit: assorted breakfast breads and pastries, sliced seasonal fruit, berries, flavored bagels and cream cheese. Salad selections: baby mixed greens, classic Caesar salad, roasted beet salad and German potato salad. Anipasti display: cured meats, artisan cheese, olives, grilled marinated vegetable platter, flatbread, lavosh, rolls and whipped butter. Chilled seafood display: shrimp cocktail, crab claws, crab legs and smoked salmon with various sauces and garnishes including cocktail sauce, remoulade, lemon wedges, horseradish, shaved red onions and capers. Omelet station: made-to-order omelets or scrambled eggs with mushrooms, ham, cheddar cheese, spinach, tomatoes, Spanish onions, smoked bacon and sausage available for toppings. Buttermilk pancakes, whipped butter and maple syrup will also be available at this station. Carving station: crusted prime rib of beef with creamy horseradish or au jus and turkey breast with cranberry sauce, mayonnaise or turkey veloute. Hot items: pan seared salmon with haricot verts and champagne shrimp sauce, Dijon rubbed pork loin with sweet potato hash, wild mushroom ravioli with garlic cream sauce and saffron rice with buttered spring vegetables. Children’s buffet: chicken fingers, curly fries, sliders, macaroni and cheese, ranch dipping sauce and ketchup. Dessert: French pastries, strawberry shortcake, fruit tarts, éclairs, crème brulee, chocolate mousse cake, New York style cheesecake and other assorted cakes. For more information on Ceres’ Mother’s Day menu, please call 702-869-7381. Carmel Room, an elegant local’s favorite, will serve a three-course Mother’s Day dinner from 3 to 9 p.m. for $55 per person. The menu includes a choice of either shrimp and scallop Dijon or duck rillette salad to start, shrimp scampi or steak frites as the entrée and strawberries Romanoff for dessert. For reservations and more information, please call 702-507-5955. The Rampart Buffet will offer a special Mother’s Day menu from 9:30 a.m. to 9 p.m. for $18.99 per person ($16.99 with a Ramparts reward card). Brunch specialties will be served from 9:30 a.m. to 3 p.m., including scrambled eggs, eggs Benedict, sunrise lox scrambled eggs, chorizo sausage and egg burritos, omelets made to order, smoked bacon, sausage links, Belgian waffles, biscuits and country gravy, cinnamon French toast, pecan waffles, cheese blintz and a variety of fresh syrups and fruit toppings. Salad bar: baby spinach salad, Asian chicken salad, Greek salad, bay shrimp confetti salad, green bean & shitake mushroom, ambrosia, chilled melon and berries and cold poached chicken. Seafood on ice: ceviche, chilled shrimp, half shell mussels, smoked whitefish, herring in sour cream and lox. Soup bar: Manhattan clam chowder, matzo ball soup, egg drop soup and won ton soup. Mother’s Day specialties: buttermilk fried chicken, tilapia Vera Cruz, rigatoni carbonara, chicken parmesan, tarragon wedge potatoes, sage stuffed pork loin, roasted garlic mashed potatoes, honey almond chicken, steak au poivre, shrimp fra diavolo, Riviera blend vegetables and succotash. 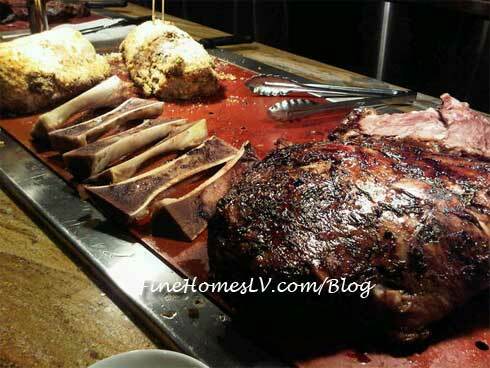 Carving station: glazed ham, roast tom turkey, prime rib, leg of lamb and baked salmon with garlic butter. Live-action crepe station: crepes flambéed to order with choice of chocolate, cherry, pineapple or orange filling and finished with crème anglaise or fresh whipped cream. Specialty desserts: chocolate mousse cake, tiramisu, assorted cheesecakes, miniature French pastries, strawberry shortcake, soft serve ice cream and gelato. Beverages: champagne, bellini’s and mimosas. For more information on The Rampart Buffet menu, please call 702-507-5944. Promenade Café offers a three-course Mother’s Day menu from 11 a.m. to 9 p.m. The first course features a choice of cream of asparagus soup or a classic Caesar salad. Entrée options include stuffed pork chop ($15.99), halibut ($17.99) or filet mignon ($24.99). German chocolate cake will be served for dessert. For more information, please call 702-507-5966.